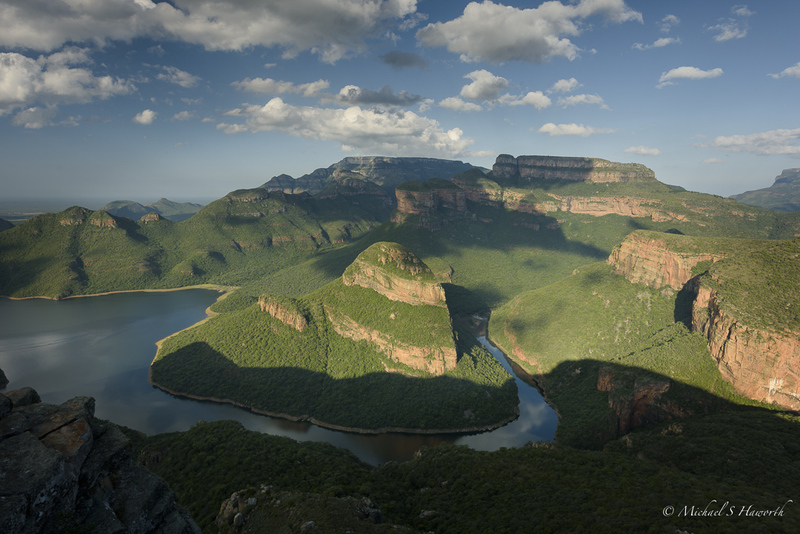 In March this year, Helen and I went to Blyde River Canyon in the Mpumalanga province of South Africa to join a landscape workshop hosted by Mark Dumbleton, who is one of the top landscape photographers in South Africa. 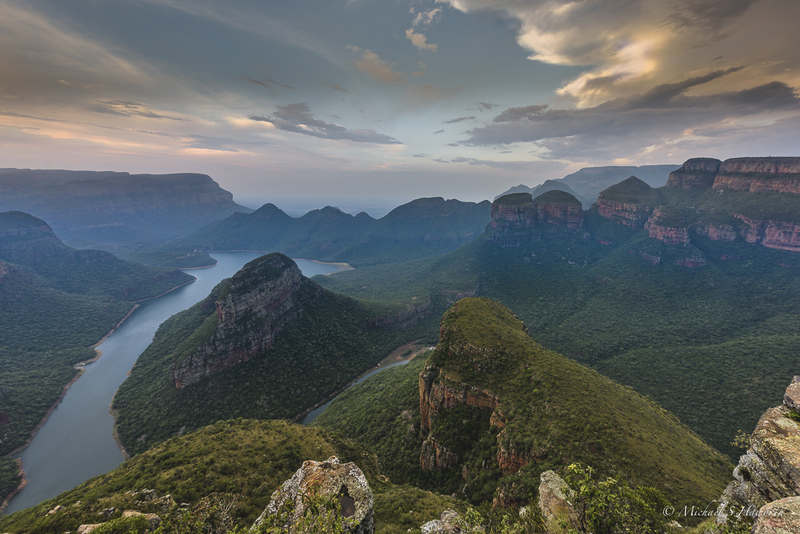 The Blyde River Canyon is situated on the escarpment at the eastern end of the Drakensberg mountain range. 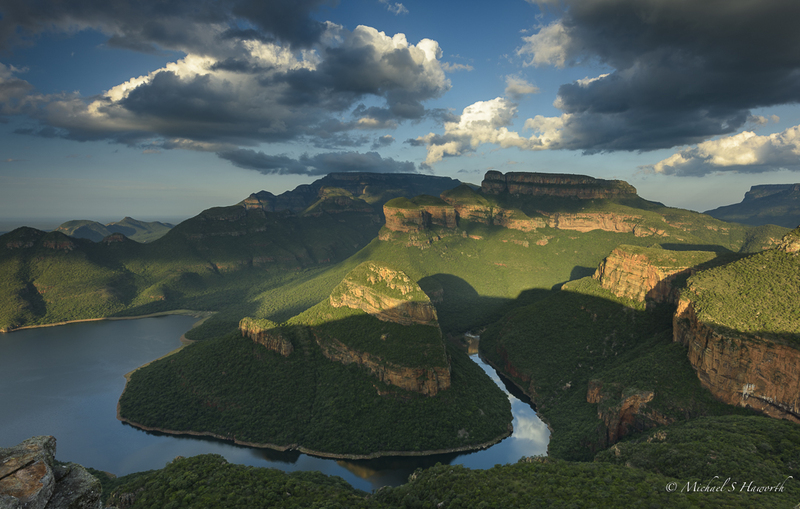 This canyon is in the Blyde River Nature Reserve which is around 16 kilometres in length. 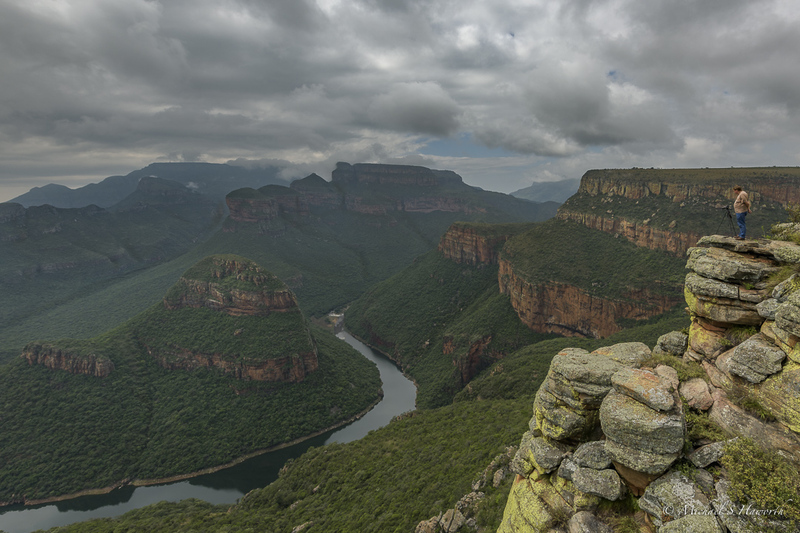 This is the second largest canyon in South Africa after the Fish River canyon. 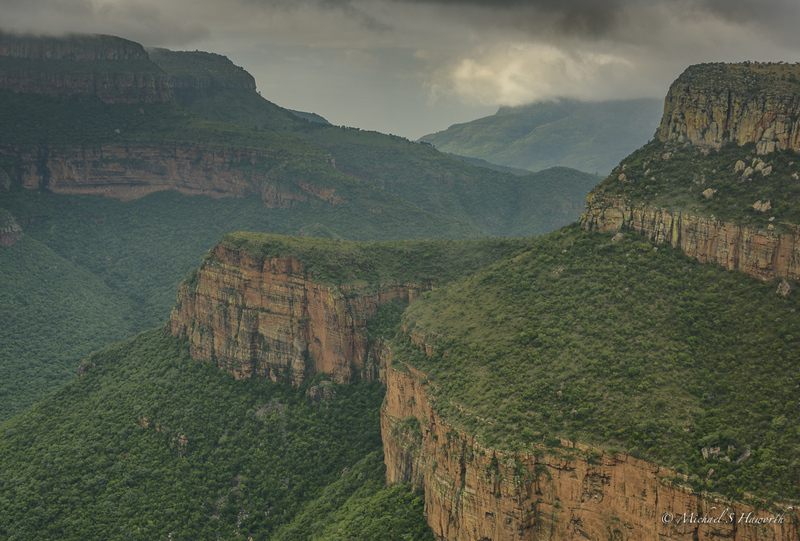 It may be the largest “green” canyon in the world due to its lush vegetation and is one of the great natural wonders of Africa. 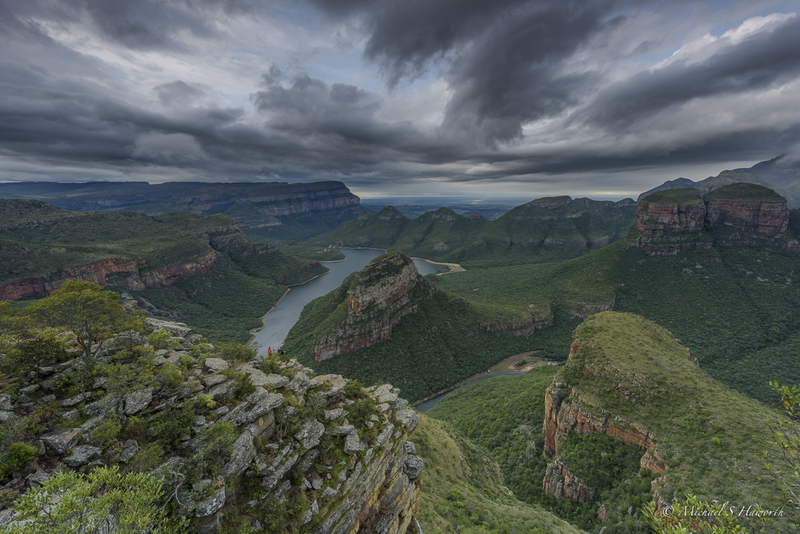 The canyon is spectacular and ideal for landscape photography. What makes it even more special is that the relief of the geography stirs up the weather which can cast many variations of light and mood over the canyon. The weather forecast was for overcast weather and rain for four of the five days of the workshop. 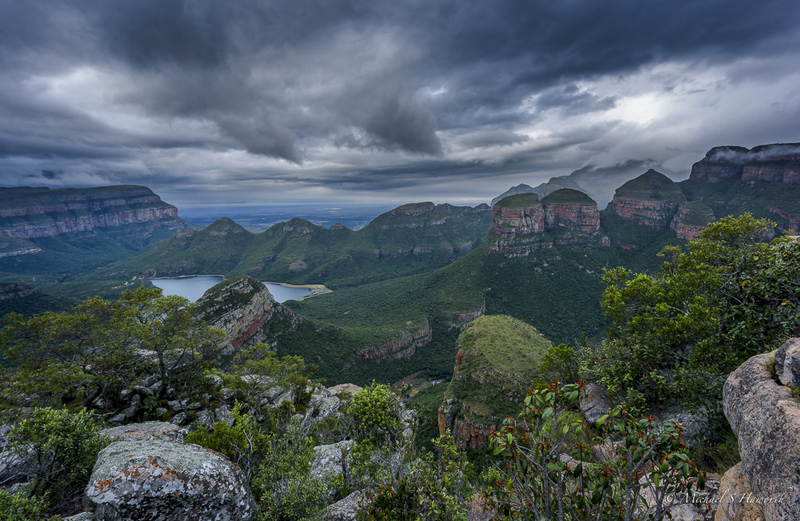 One aspect I really enjoyed was learning to shoot landscapes in all-weather conditions. Landscape photography relies on taking advantage of any weather conditions and playing with perspective and composition. 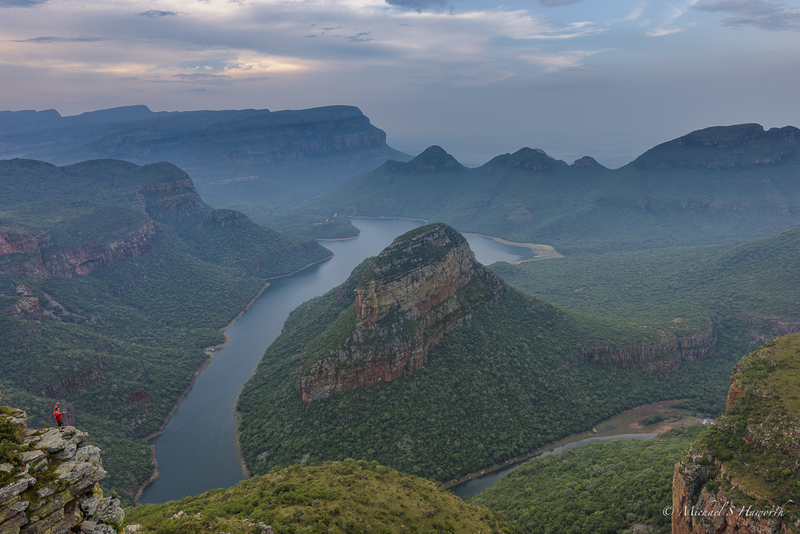 The Blyde River Canyon is known for its huge and round buttresses, popularly known as the ‘Three Rondavels’, the Swadini buttress and the Blyde dam. The first morning it was dark, very overcast and pouring with rain. We climbed down into position on the canyon wall but had to wait it out with our camera bags under our ponchos for about an hour in the semi-dark. The sun never managed to shine through the thick cloud but it gave us opportunities to photograph our subject, revealing its many moods. The clouds and mist swirled through the canyon so there were opportunities to photograph the canyon with some parts exposed and others disguised. 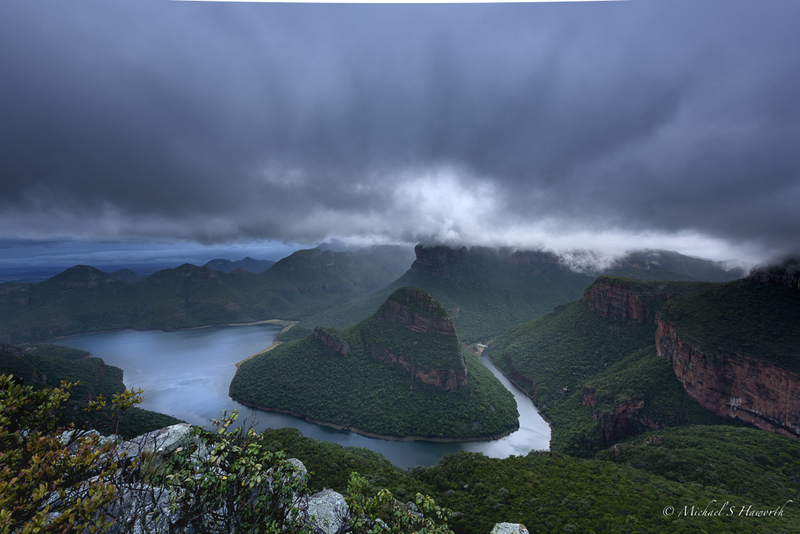 On the left hand side of the next image is the great Swadini buttress in the distance just below the clouds. This vast buttress comprises harder quartzite which forms the vertical cliffs, while softer shale has eroded to form the talus, or sloping sections which are now covered with vegetation. Capping the escarpment is a layer of hard, black reef quartzite. 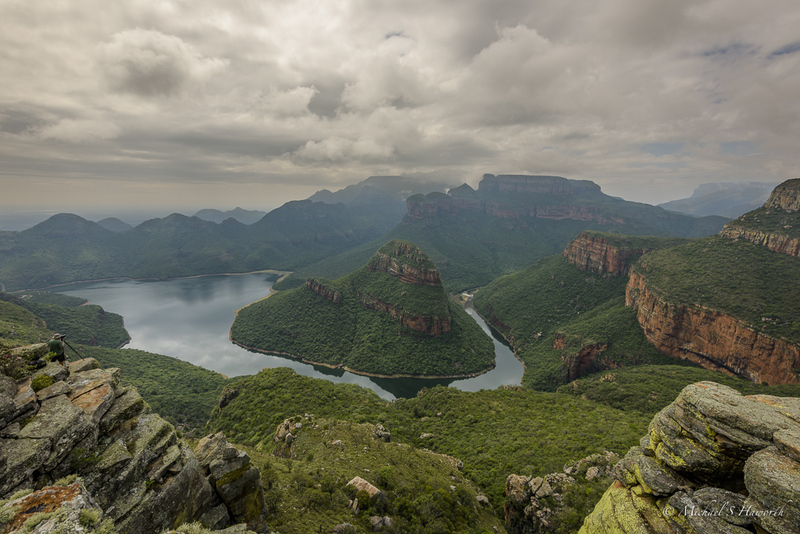 One dramatic geological feature of the area is the “Three Rondavels”. They are huge pinnacles of rock rising above the canyon. The tops of these pinnacles are shaped like traditional beehive huts, with sloping walls and domed summits comprising quartzite and shale. Looking north-east on a moody, overcast afternoon. Landscape photography is about experimentation. This image was taken using a 70-200mm zoom lens to change the perspective by magnifying the background. It also showed the enormous quartzite cliff faces. I mostly used a 24-70mm lens but of course with the wide-angle you needed to get close to the edge of the canyon wall to alter the balance of foreground and background in the image. The next image shows minimal foreground, a moderate portion of middle ground and vast vistas of background. To give you an idea of the steepness from the top of the canyon wall, Mark, in his red jacket, was standing (below) on a rock promontory overlooking the canyon. It was around 800 metres from that point to the bottom of the valley. At last the sun came out to play. Given the dramatic relief of the area it became a game of playing with shadows. In the afternoon we wandered to our preferred lookout but the late afternoon shadows cast large areas of the middle ground. 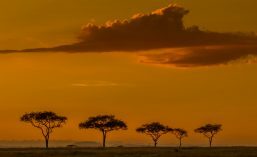 The clouds also cast shadows so it was also about looking and waiting for clouds to cast shadows in the right areas to emphasise the dramatic landscape. One of the photographers in the workshop, Peter Guthrie, in a zen mood contemplating the universe from a commanding perspective. 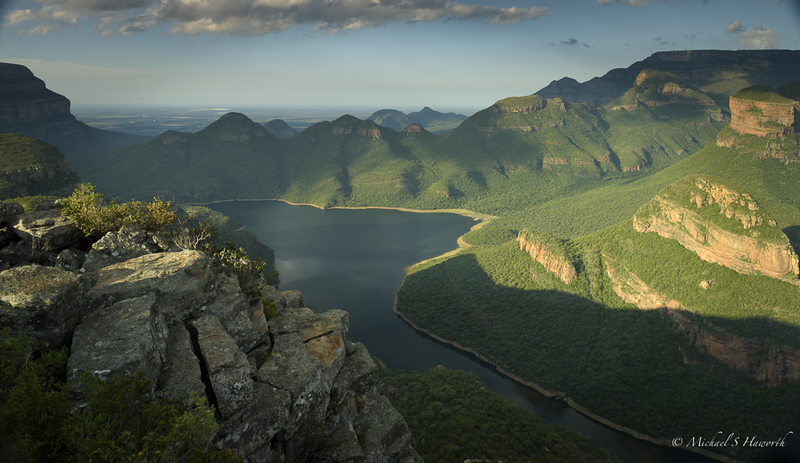 Looking east across the dam towards the “Three Rondavels” in the middle ground and Mariepskop in the distance behind them. I included some of the foreground to give a greater sense of the steepness and depth of the canyon walls. 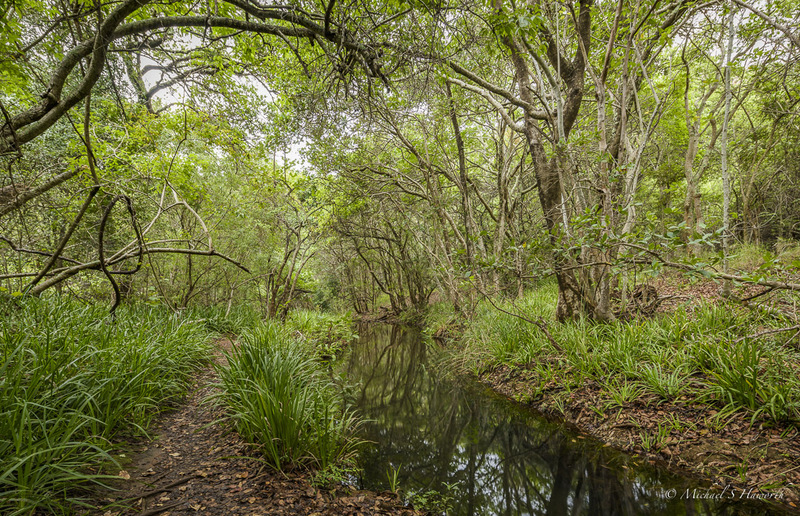 To mix up our shooting, Mark took us down below the Forever Resort to wander along some trails and streams to find different subjects. 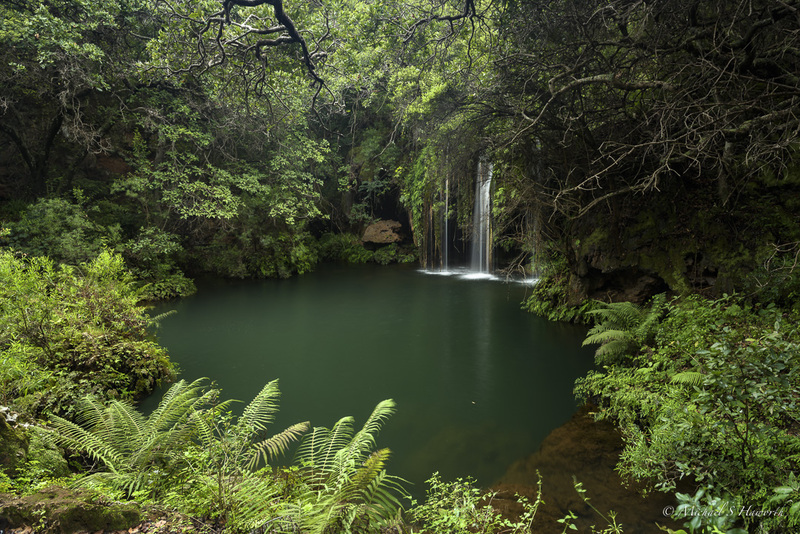 The next image was in a forest where a small stream cascaded into a pool of crystal clear water. It was relatively dark because the sky was very overcast. It was dead quiet and exquisitely beautiful. Changing the perspective a little by moving a few steps downstream. There were six photographers so it was quite tricky to get an image without a fellow photographer in it given we were using wide-angle lenses. 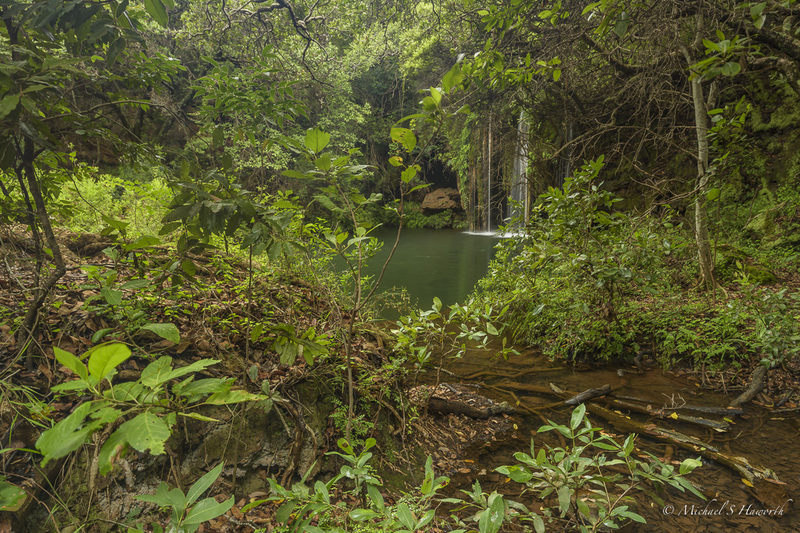 Downstream from the waterfall was a small stream lined with trees. We saw an African Finfoot swimming and fishing in the stream. They are very shy birds and it quickly moved into the undergrowth next to the stream and out of sight so I could not get a shot. On our last day the sun came out. The interplay of light and shadows on the dramatic relief of the canyon created some interesting new ways to look at the scene. Another image of Mark standing at the edge of a protruding rock face. Over the edge of that particular rock was almost straight down to the valley floor. You can see just how much the mood and look of the canyon changed in the late afternoon sun with clouds adding to the shaping of the image. Thank you Mark Dumbleton for a really interesting workshop. I learnt new smart techniques for establishing the hyperfocal length to get maximum depth of field. I learnt how valuable “live view” can be. I also learnt that there can be some incredible opportunities to photograph the chosen landscape no matter what the weather throws at you. It just takes a particular cloud formation or mist swirling in the valley or an interesting shaft of light to break through the clouds to alter the mood and presentation of the subject. Our editing session in Lightroom was helpful and you also pushed me to get started in Photoshop, for which I thank you. Explore, seek to understand,marvel at its inter-connectedness and let it be.